Boris Bally creates boldly graphic chairs from upcycled traffic signs. 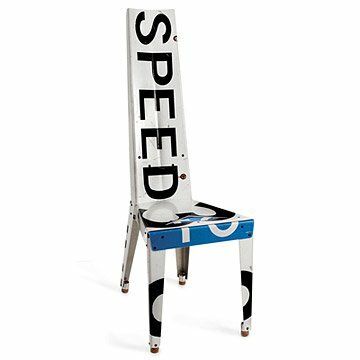 Artist Boris Bally creates bold, beautiful chairs out of actual traffic signs: this urban expression of glass-on-metal represents many years of collecting hard-to-find and specially weathered signage gleaned from ten-foot-high, thirty thousand pound scrap piles. Bally extracts the most important elements of the gems he finds, joins them to create exciting color and image combinations, and adds details through hand-sawing and filing. Handmade in Rhode Island. Until Boris Bally began experimenting with recycled traffic signage, nobody had seen the potential elegance of this discarded aluminum. He has since challenged himself to discover its properties, in order to create bold objects of beauty which transcend their common roots. Boris brings decades of training and experience as an artist to his collection of pieces. Signage has become his passionate medium of choice not only because of the recycling message, but also its appeal to him as an extreme variation on the age-old tradition of enamelling. His perpetual search for alternatives, variations and challenges becomes a repetitive pattern of discovery and incremental growth. Boris attempts to produce pieces of technical integrity and rich content, and his work is also influenced by the timeless techniques and forms he first discovered in the armories of European castles (raising, riveting, perforating, layering, piercing and forming) used to create representations of Medieval heraldry. Some assembly required. A photograph of the specific chair available at the time of purchase can be provided upon request. I'm glad I bought two! I purchased this chair mostly because of it's "COOL" factor. It is extremely sturdy as well as comfortable & light weight. Great for small space. I've been thinking about this chair for a long time. Very happy to finally have one... well two. The cork feet will never hurt my wood floor. Delivery time was great! I have nothing bad to say about this product or Uncommon Goods. I love their products.